Buying a vehicle is tough enough with all the high-pressure sales tactics and tiresome haggling. 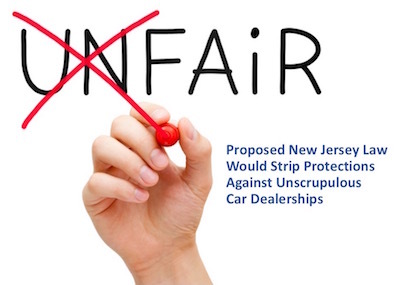 But now the special interests that support big car dealerships want to defang New Jersey's Consumer Fraud Act. This law has protected citizens here for decades from unscrupulous dealerships when either buying or repairing a vehicle. Of course, most dealerships are ethical and try to treat customers fairly, but the Consumer Fraud Act is a strong deterrent for those that don't. Learn more in this newsletter and then ask your local Assembly member to vote NO on the dealership bill A-4292. New Jersey’s Consumer Fraud Act is a model of consumer protection legislation envied throughout the country. But some legislators want to strip away key consumer protections from people who buy new or used automobiles from dealerships, or use dealerships for repairs and maintenance. You should know more about what they are trying to do and why it’s just not fair. Send a prewritten message to your representatives and ask them to vote against A-4292, a bill to weaken consumer protections against fraud in New Jersey.